Freezing corn is a little messy, but it’s not hard at all. You’ll be glad you did it when you have a little taste of summer come January. First off, get yourself some corn. Around these parts, corn is as cheap as it’s gonna get, so buy a lot if you don’t have any in your own garden. Make sure that your corn is really fresh (as in picked the same day) because corn goes downhill fast, and old corn is just not that good. Shuck it. Plop it into boiling water, and let it cook for 4-5 minutes. Using a propane burner for the blanching step, so you are able to do all the corn processing outside, which makes it a million times easier to clean up afterwards. 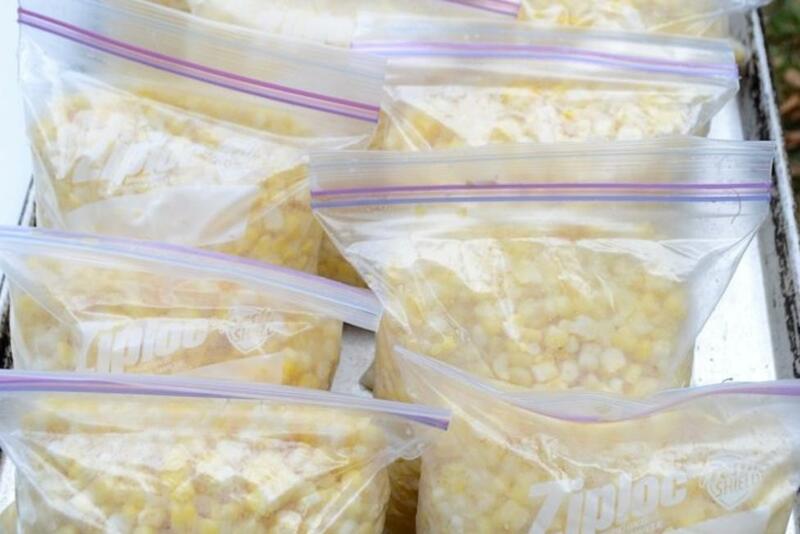 Pull the corn out of the hot water and immediately plunge it into cold (preferably iced) water to halt the cooking. Cut the kernels off the cob. In this step, there’s a fine line between wasting corn and hacking into the pith, but you’ll get the hang of it pretty quickly. When you have a big pile, scoop it into Ziplock bags and toss the bags in the freezer.